Decorate everything from a day planner to birthday cards with these whimsical stamps. Pegasus for your pen pal. Rainbow next to "running club" on the calendar. 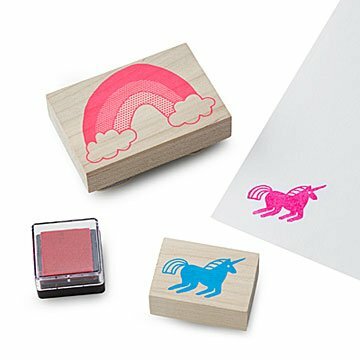 Decorate everything from your day planner to birthday cards with these whimsical stamps using the included bright pink inkpad—if the color alone doesn't put a smile on their face (and yours), the unicorns sure will. Because... c'mon. Unicorns. Made in Mexico. Read more about Christine Schmidt's quirky creations and the inspirations behind them on our blog. And now you can tour her studio, too! Christine Schmidt's art career began in primary school when she won a bike in the local grocer's coloring contest (it was red and had ten whole speeds!) After a youth spent on the plains of Kansas City and art school in Washington D.C., she and her boyfriend, Evan, moved west to a little place perched atop windy Bernal Hill in San Francisco. Fueled by too much black tea and public radio shows, she spent nights creating hand-printed cards and gifts. Seeking out local suppliers and working with fine, earth-loving materials, she began honing her line of wares. In 2007, after steeling her nerves, Christine took a box of her goods to some local stores...they placed orders, and Yellow Owl Workshop was born. Christine's workshop now bustles with a team of hard-working ladies in a sunny Mission district studio. Though it's grown, the workshop's original values of attention to detail, ecological awareness, and premium, American-made materials are evident in every product. To clean, wipe with damp cloth or paper towel after stamping. Good quality stamps with an image that comes out clean. They can be used on cards, student papers or just stamp away for fun.